My Northwell Health story is really a culmination of a journey that started years ago. My family emigrated from a third world country where poverty and disease were pervasive. Traveling to my native land created this burden in me to help solve these issues. By 2007 I was riding the wave of believing in our own capabilities and I came to the realization that my efforts needed to be focused on a very specific mission. I then became determined to build hospitals and clinics in under privileged areas around the world. In 2009 I decided to attend Stony Brook University where I enrolled as a pre-medical student. I believed my passion for medicine and my affinity for sciences would provide the means to fulfill my mission. 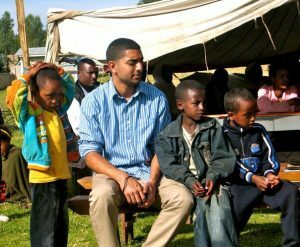 During my sophomore year of college there was an opportunity to assist on a medical mission’s trip to Ethiopia. 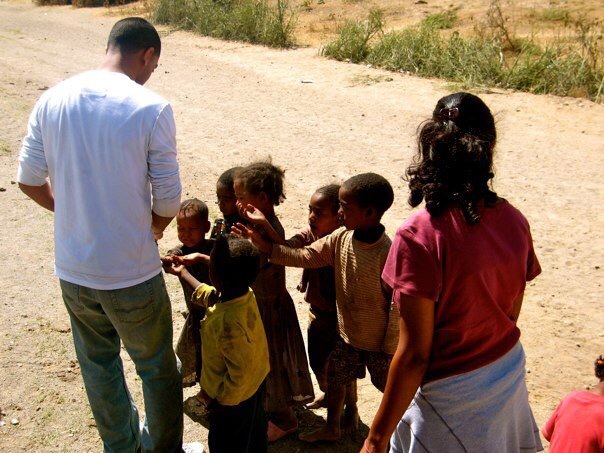 I traveled 6,994 miles away from all the comforts I had to help the people of this country in any way I could. The experience really exposed me to suffering once again, but something within me changed. The country and the people were beautiful, but the sheer neglect for life, health and opportunity were appalling. Images of children on their last hope were seared into my brain, and I knew I needed to take action. After returning from the trip, I decided to study the science behind healthcare delivery. I was fascinated by the magnitude of complexity involved. I would spend all of my free time reading books on anyone remotely related to building healthcare systems from Otto Von Bismarck to Patch Adams. The irony of my fascination was that our country was dealing with healthcare reform at the time which only furthered my interest, and shifted my focus away from the clinical aspect of care. I decided then to leave the pre-med track and enter a healthcare management program. After making this difficult decision I formed a club with like-minded individuals who had a passion for the underserved communities of the world called Free the Children. The purpose of our club was to build a school in Sierra Leone, West Africa. 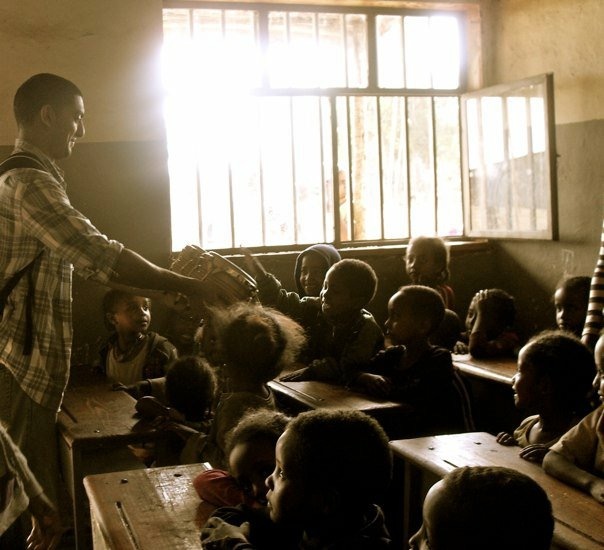 We found that education decreased disease prevalence within communities, and so for a country that had been torn by civil war for decades we focused our efforts in this particular area. After three years of giving lectures, motivational speeches, and fundraising we were able to give a significant portion to the school. The experience provided some relief for the burden I was carrying, but I still felt an overwhelming desire to do more. During my final year of undergraduate studies I entered my concentration of healthcare management where I was exposed to the many different aspects of care delivery. Having a teaching hospital so connected to the university provided opportunities I would otherwise not have. I volunteered in one of the healthcare management departments at the hospital where I met key individuals who encouraged my dreams and gave me guidance on what I should do next. Ultimately I was advised to apply to business schools in New York. Hofstra’s Zarb School of Business, and during my first year in graduate school I went to an alumni event where I would meet Dganit Raviv (Dee), the Director of HR Analytics at Northwell Health. Dee and I really hit it off, and she provided great advice on how I would be able to penetrate the healthcare job market. Six months later I began applying to internships for the summer and eventually found an opportunity for an operations internship with CVS Health. I spent my time working on a project to implement Medication Therapy Management within the region, and met many great people, but ultimately I really wanted a role within healthcare. I mentioned to Barbara, my manager at the Zarb Career Center, that I was having trouble finding a suitable internship. My manager then reached out to a friend at Northwell Health to see if there was any availability without my knowledge. A few days later I got a call from Dee, the woman I had met at the alumni event six months earlier. I came in for an interview and was offered a temporary full-time position as a strategy analyst. 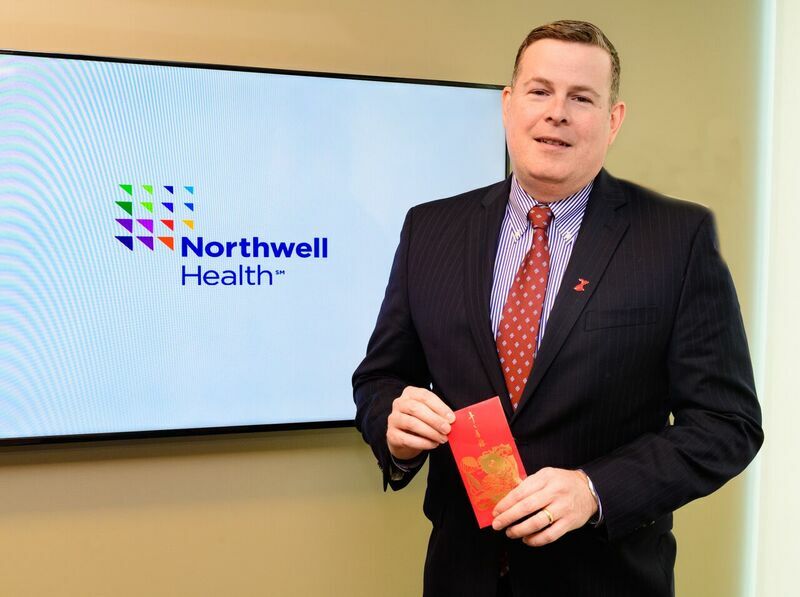 I was able to get my feet into health care while also completing my degree by joining Northwell Health’s internal temporary staffing agency, Flexstaff. A few weeks after I started Dee told me she would love to have me join her team permanently, and I have really enjoyed the experience. I’ve had so many opportunities to meet great people and attain valuable skills during my time here. I’ve worked on projects to increase revenue growth through people strategies concentrated on attaining and retaining talent through quality of hire initiatives, to implementing five year plans for merger and acquisition integration efforts. Perhaps my proudest accomplishment was creating a departmental Think Tank focused on capturing innovative ideas and driving the business forward. This started with three people and grew to over 40 dedicated individuals. I’ve been afforded many opportunities in my role, and I’m grateful for the opportunity to develop essential skills and tool kits for the future. 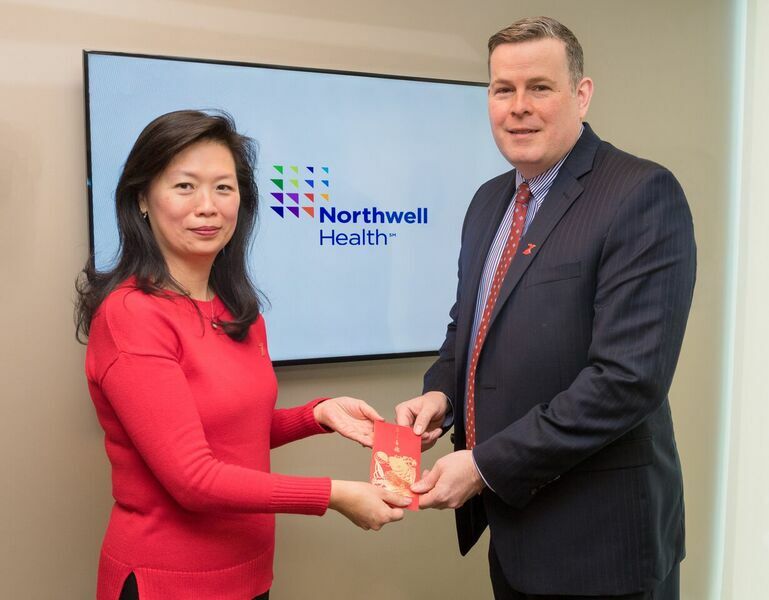 Northwell Health has provided me a great platform to learn new aspects of healthcare, and I hope to use these experiences to fulfill my dreams of building my own hospitals and clinics around the world. Thank you to all of you who have played a role in shaping and guiding my future and special thanks to Northwell Health. 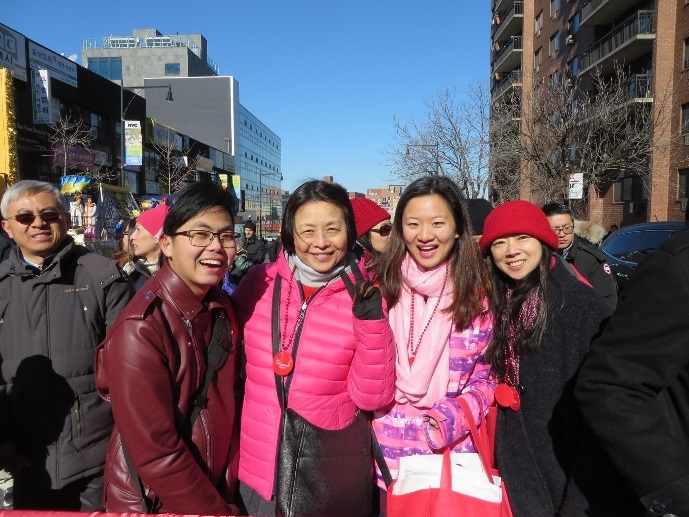 Spanning a total of fifteen days, the Lunar New Year is a joyous time of renewal marked by gatherings with family and friends, elaborate feasts, parades, fireworks and gift giving. It marks the return of spring and reunion of family. One thing that makes the Lunar calendar different than the Gregorian calendar is its use of representative animals, following a 12-year cycle, and 2017 ushered in the Year of the Rooster. Marking the end of the holiday, a magnificent red lantern festival will be on display as celebrants symbolize their letting go of the past and welcoming in of future good fortunes. 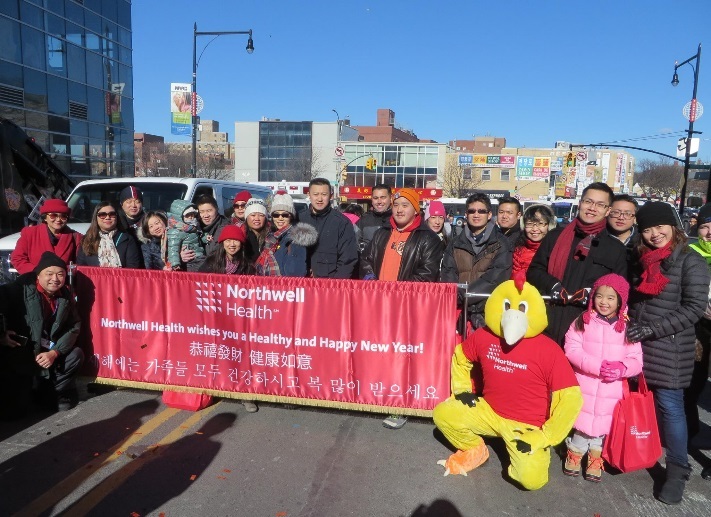 On February 4th, for the eighth consecutive year, contingents from Northwell Health marched in the Lunar New Year Parade in downtown Flushing, New York. 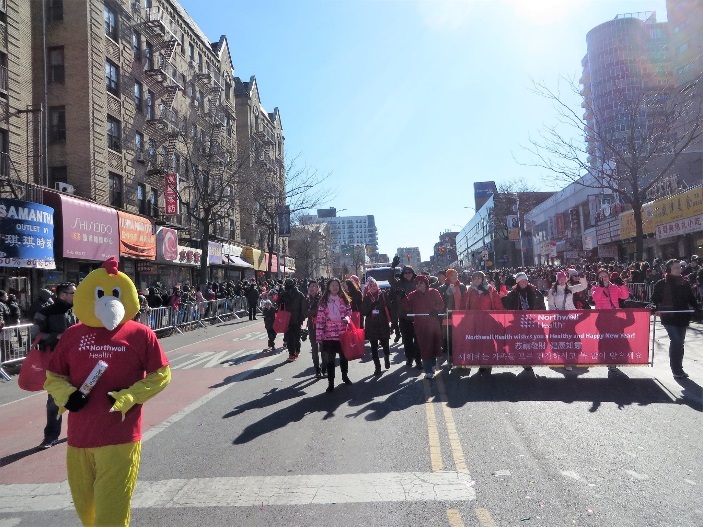 The parade is the highlight of Lunar New Year celebrations in Flushing, including dragon dancers, kettle drummers and fireworks. The march draws a considerable amount of spectators each year. 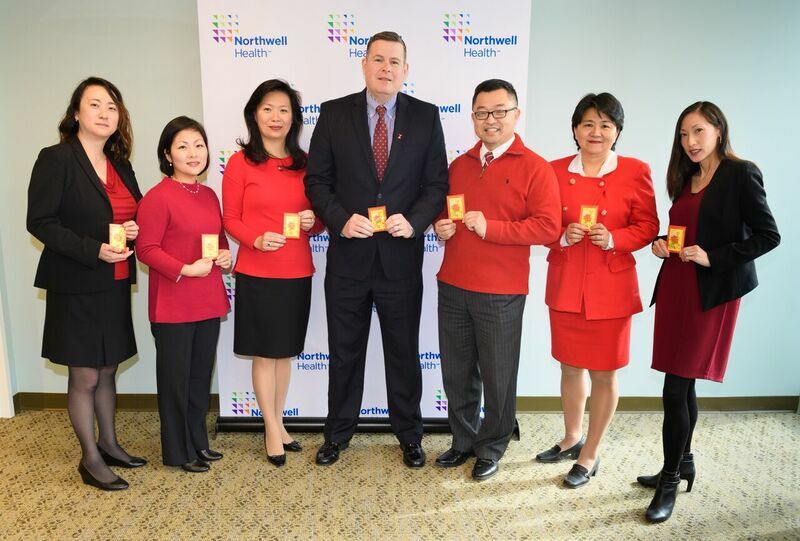 Demonstrating its commitment to the Asian-American community, the senior leadership at Northwell Health participated in the customary tradition of receiving and gifting red envelopes to its Asian-American employee business resource group (BERG). Our Chinese BERG leadership also had the opportunity to network with some of the most prominent, world-renowned Chinese medical scientists and researchers at the Northwell Health Feinstein Institute for Medical Research, during its annual Chinese New Year luncheon, hosted by the Chinese Association at the Feinstein Institute (CAFI). What a great honor to be surrounded by creative thinkers who share a singular focus of advancing science to prevent disease and cure patients (pictured above). Lunar New Year, also known as Spring Festival, is China’s most important traditional festival. It is also a time for families to be together and celebrate a year of hard work and wish for a lucky and prosperous coming year. Chinese people believe that a good start to the year will lead to a lucky year. On New Year’s Eve, every street, building, and house is decorated with red. Red is the main color for the festival, as it is believed to be a “lucky” color. Red lanterns are also displayed in streets; red couplets are pasted on doors; banks and official buildings are decorated with pictures and writings representing prosperity. Just in the western culture, gifts are exchanged during the festival. The most common gifts are red envelopes. The envelopes have money in them and are given to children by the elder of the household. According to a legend, there was monster that would come out during the New Year’s Eve and terrify children while they were asleep. To keep children safe from being harmed, parents gave their children eight coins to play with the monster, in order to keep him tired. The children would distract the monster by wrapping the coins in red, opening the packet, re-wrapping and re-opening the packet until the monster was too tired to fall asleep. 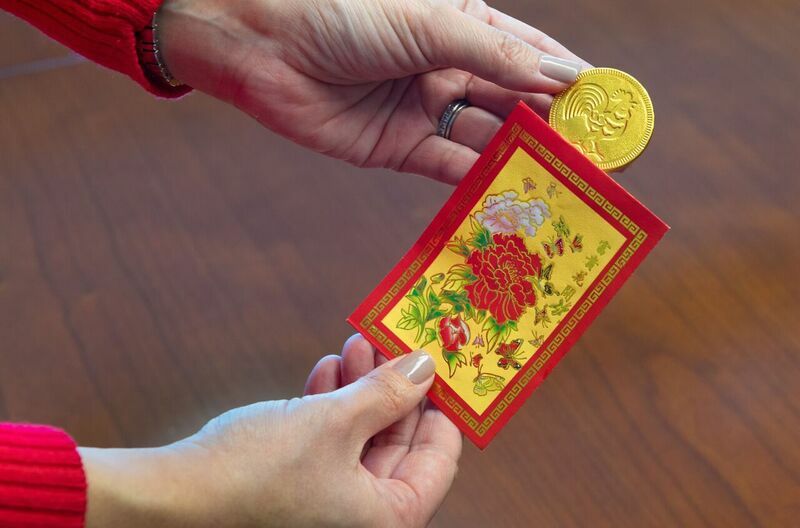 From then on, giving red envelopes to children became a way to keep them safe and bring good luck. From the time I was a little girl I knew I wanted to be a nurse. I can remember even as a 6 year old bringing my friends in to our home to tend to their battle wounds from climbing trees, falling off bicycles or roller-skates and the like. My mother kept a constant supply of antiseptic cream and brightly colored Band-Aids for my use. That was the beginning. At nine years old my father had suffered a heart attack. I had learned some basic first aid in the girl scout troop and recognized his symptoms . I’d visit him (children weren’t allowed in the Coronary care unit in those days) and observe through glass partitions all that the nurses were doing. I was sure then, that was what I wanted to do. My very first job that would open the gate to involvement in the now Northwell Health system began over 30 years ago in Glen Cove Hospital even before it was ever part of the health system. Starting as a per diem nurse gave me the opportunity to work in a variety of environments, but it was Critical Care that called to me, and it has served me well. I had already moved into a position in the coronary care unit when Glen Cove became one of the first acquisitions to (at that time) NSUH. Maybe it was my family history, but I became very interested in at risk populations and volunteered to work on joint programs with the hospital and the American Heart Association. The health system supported my interest and the program continued to grow. We began to develop a support program for patients with a variety of cardiac diseases. – all the while I continued to explore other options in my employment moving to the broader field of critical care. I knew I wanted to go back to school (I already had my BSN). Because of the great tuition reimbursement program, I was able to return to school to obtain my MSN in Nursing Administration. Opportunity knocks in our health system; you just have to answer the door! While attending school I became the critical care educator for Glen Cove. The wonderful thing is that while hired for a specific site, this roll enabled me to work not only on site but to collaborate on system wide task forces for things like stroke, CV disease and other best practice programs. There were always opportunities to grow, and the leadership teams greatly encouraged, welcomed, and supported me. I wrote and successfully was awarded a grant to expand stroke education. Being an educator allowed me to use my years of nursing knowledge to help others both on the patient front and in nursing and beyond. A few years after becoming an educator an opportunity for a management position became available and again I received the full support from the leadership team. I never would have imagined, even then, that I’d be where I am today. Because I have always been active in my professional organization of AACN (American Association of Critical Care Nurses) I had been increasingly aware of something called tele-ICUs (eICU®), part of an emerging field called telemedicine . When I saw that there was a director’s position for this program in our own health system, I jumped at the opportunity to apply. Low and behold I got the job. It seems that although I was based in a community hospital the work I had done over the years was recognized. I can’t think of many other organizations as large as ours, where there is such accessibility and visibility to senior leadership. I could go on but suffice to say that I have moved from Director of the eICU program to AVP for Telehealth and now VP for Telehealth services. This highlights the opportunities and ability of our health system to be progressive, agile, and welcoming all at once. I am one of the fortunate who truly loves going to work every day. 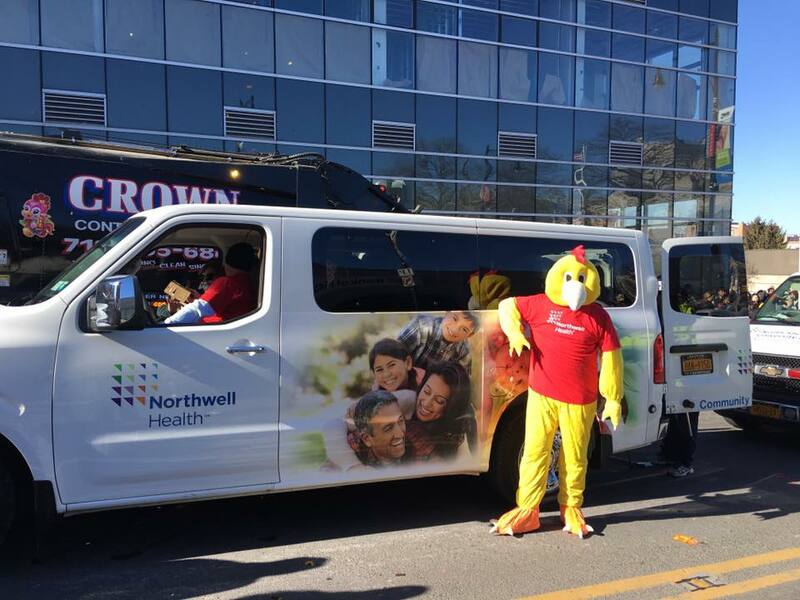 I am so proud to be part of this wonderful organization now known as Northwell. John Quincy Adams once said: “If your actions inspire others to dream more, earn more, do more and become more, you are a leader”. Because our Northwell Leaders are visionaries I have been allowed to dream, be and do more! Explore our teleheath career opportunities. Picture: Iris (First woman on the left) with employees on her eICU team. My journey within Northwell Health started off 30 years ago when I was born at Long Island Jewish Medical Center. After a brief 20+ year hiatus, I returned in a very stereotypical way – I was a student who needed a side job with lots of shifts and flexible hours. After some investigation I applied to work per diem as a patient transporter at North Shore University Hospital, where I worked at night while I was completing my master’s degree. It was a perfect fit for me; I was able to converse with patients as I wheeled them around the hospital for their various tests and discharges. As I was completing my degree, I applied and was accepted to the PhD program at the Hofstra Northwell School of Medicine. I wasn’t sure what I specifically wanted to work on, but I knew I had a knack for technology and a new found appreciation for Orthopedics & Radiology. I worked 4 years at the Feinstein Institute for Medical Research completing my degree in the Laboratory of Orthopedics Research under Dr. Daniel Grande PhD. 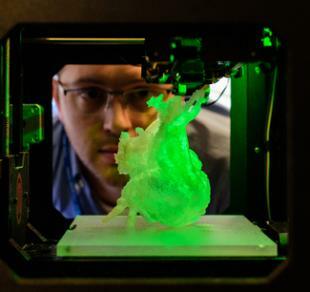 We spent countless hours working on 3D bioprinting of cartilage, bone, and tracheal tissue. The environment I “stumbled into” was one of collaboration, innovation, and patience. It was challenging, but very rewarding. The lab provided an environment filled with students, residents, fellows, physicians, and research scientists all working to further medical knowledge and create new treatments for patients in need. Anyone in the lab was able to “grab the bull by the horns” so to speak, and take on a project they deemed interesting. You took ownership and were able to see it through to the end. One day, in walked two chief surgeons with the idea of tissue engineering lab grown tracheas. Dr. Lee Smith MD and Dr. David Zeltsman MD were interested in our capabilities within the lab and if we were willing to work with them on a non-orthopedic project. 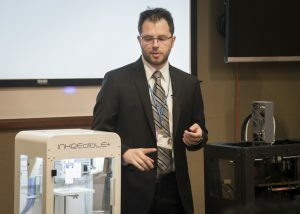 Dr. Grande said “Todd if you want to spear head this project, go right ahead, just let me know what you need.” Over the next two years we worked to build up a protocol to 3D bioprint tracheal replacements in the lab. It was our hope of one day transplanting a replacement into a patient – to restore their breathing would become a reality. Once I had the support I needed, we began right away. While we are not at a point to transplant lab grown organs, we are well on our way. 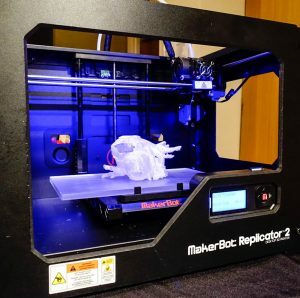 To kick off this type of project we started to build our own 3D printer that could create our tissue since the commercially available printer options were extremely expensive. We took a desktop 3D printer, stripped it down to its guts, then using design software created new printer heads that could accept living cells within a jello like material. Many early mornings and late nights watching the 3D printer whirl around in circles placing layer after layer of cells, gel, biocompatible, and biodegradable scaffold materials were necessary to get this idea to become reality. After much trial and error we were able to print a living “breathing” lab-grown trachea. 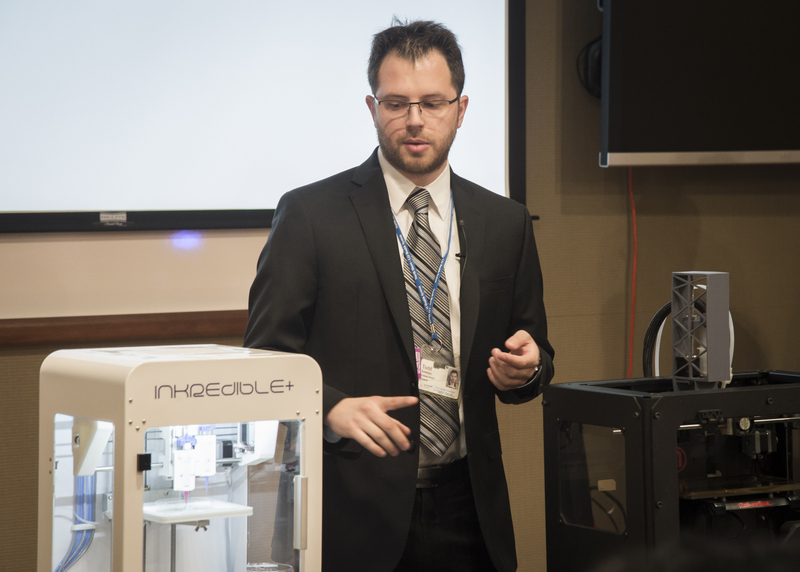 In the beginning of 2016 the 3D bioprinter was submitted into Northwell Health’s Breakthrough contest where the winner received additional funds to further their research and make their scientific dream a reality. All of the 61,000 employees in our organization were able to vote on the breakthrough that they found the most significant in effecting patients care, and the printer happened to be the winner. 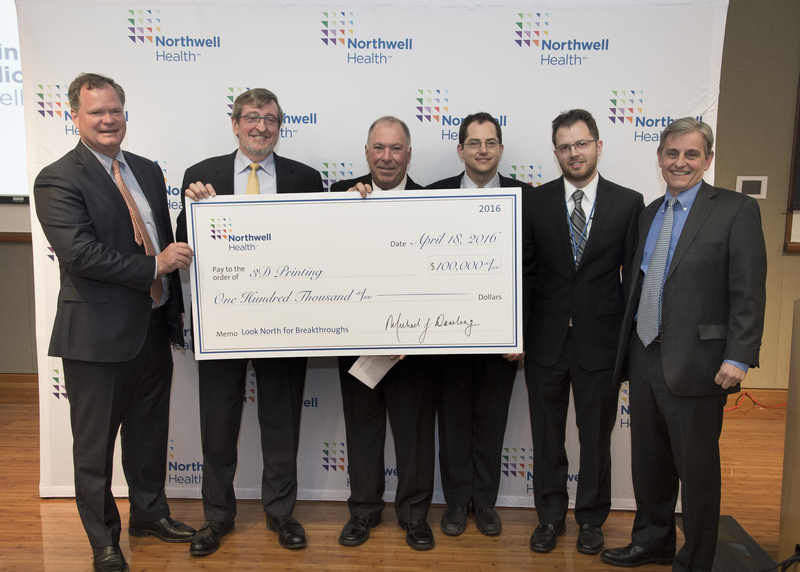 Without Northwell’s support this project would still be just an idea. I have been able to take away important skills throughout this journey – whether it be about patient customer service, or a complicated statistical analysis of scientific data, without the Northwell Health family like environment I would still be wandering the halls looking for my niche. 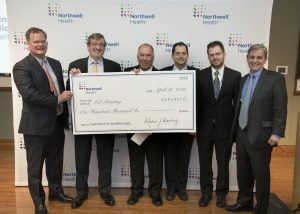 I have now graduated from the medical school and Northwell has created a unique roll for me as I share my time between the Orthopedics Lab and the Northwell Ventures Team serving as a technical analyst, as the hospital rolls out new innovative business ventures furthering our patient care capabilities. I now get to help shape the innovative future of healthcare, both in and out of the lab, as we take ideas from the bench top and translate them to the bedside.